The inaugural game of the second edition of the T10 League couldn't have got off to a better start. Afghanistan wicketkeeper Mohammad Shahzad smashed a 12-ball fifty and finished unbeaten on 74 from just 16 balls as Rajputs chased down the target of 96, set by the Karachians in just four overs in the opening game of the season at Sharjah. Chasing a target of 96, Shahzad started like a man on a mission. After starting with a single off the first ball, he hit his next four balls for boundaries and raced to 19 off 5 balls. Although Brendon McCullum took over in the second over and got his side halfways towards the target, the carnage came in the third over of the Rajputs chase. Shahzad smashed Sri Lankan all-rounder Thisara Perera for three sixes and three fours in his first over as he got to his fifty in just 12 balls. At the end of the over, he was batting on an incredible 56 from 13 balls and just 23 runs were needed for victory with seven overs still to play. After Fawad Ahmed bowled a sedate first three balls, which went for just five runs, Shahzad got on strike and finished the match with three successive sixes and the target of 96 was achieved in just four overs with 10 wickets to spare. Shahzad finished with 74* off 16 balls and hit six fours and eight sixes. Not only did he not even face a single dot ball, the innings saw only one dot ball being bowled as Rajputs romped home. 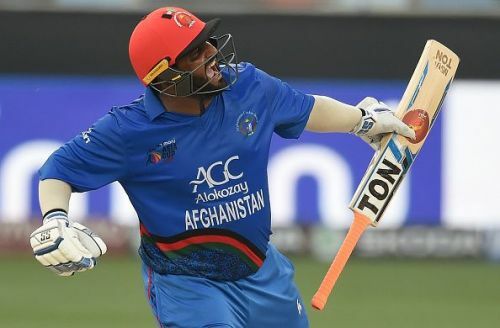 It was a record-breaking day for the Afghanistan batsman as he not only broke the record for the fastest fifty in the tournament but also hit the highest score in the tournament's history. Rajputs captain Brendon McCullum won the toss and elected to field. The Karachians didn't get off to a great start but thanks to captain Shane Watson's 20-ball 42, they posted 94/6 in their 10 overs. But once Shahzad got going, that just wasn't close to being enough as the Rajputs finished their innings with a run rate of 24. Evolution of cricket: Is T10 the right kind of innovation that the sport needs?